Andrzej Wajda. Official Website of Polish movie director - Films - "Pilat And Other"
I wasn't satisfied with the first two versions of the script which I had commissioned in Warsaw. Luckily for me, at that time Bulhakov's novel Mistrz i Malgorzata [The Master and Margaret] was first published in Poland. I was thrilled by it. I realized that I would not find a better text for the film than the story of Pilate. Everything was there: Christ, Pilate's dark intrigue, Judas' betrayal and the desperate loneliness of the single disciple and Evangelist. I cast Polish actors in all the parts in the film except two, which were played by Germans. I also chose the location for Pilate's palace. Initially, it was to be a strange, ruined building on the hill over Kassel - the water works for the palace fountains built by Huguenots exiled from France; my instinct, however, told me that I needed something contemporary. This is how I landed in Nuremberg, where I saw, for the first time, the ruins of the Third Reich. This pseudoRome was an ideal setting for Pilate, providing an ironic commentary on the short history of the allegedy "thousand year" Reich, whose quick collapse I saw with my own eyes. Shooting on the platform, from which Hitler had delivered his speeches during the Nuremberg rallies of the Nazi party, was a particularly moving event for us. We belonged to those Slavic nations which were to be destroyed in order to make the Drang nach Osten possible. And here we stood, alive and well, on the ruins of the Third Reich, making a film! During those weeks I felt I really was a free man. I have never forgotten that personal and creative freedom. I placed the scene of Calvary at a dump near a motorway entering to the city. This is how all sites of torture must have looked in ancient times, since their main goal was to frighten the people. I remember well two public executions during the Nazi occupation. Both took place at the entrance to the city, near big factories employing thousands of workers; who on their way to work and back had to pass by the gallows standing by the roadside. In the film, I showed tourists who crowded at the coach windows to catch a glimpse of an execution. But a modern motorway has a will of its own: the road signs, which forbid vehicles to stop, solve the moral problem. If we had nailed a man to the cross with real nails, their reaction would have been the same. What can one do for a suffering man, how can one help him, if the coach cannot stop anyway. I believe the film conveyed the sadness of the indifference and loneliness of death. During the shooting of Pilate and Others Andrzej Lapicki was our mentor not only owing to his perfect knowledge of German. I believe he had the best feeling for the historical paradox which allowed us to make such a strange film in Germany. It all began with the costumes. Afranius, Pilate's secret agent played by Lapicki, had to have a contemporary costume. I told Andrzej to take some money from the production office, go to a department store and buy some ordinary clothes. A few hours later he came to show me what he had bought. I was delighted: anyone could recognize that the grey overcoat and nondescript hat shrouded a secret police agent. My impression was confirmed soon; a few days later we shot some scenes in a city hothouse. Andrzej was sitting on a bench, his overcoat unbuttoned, warming himself in the sun. Under his Jacket one could see a holster and a pistol. Suddenly, a couple of passersby approached him: "Some Poles are making a film over there". "Yes, of course. I know", replied Lapicki. They said: "You'd better keep an eye on them!". 13.2.1975. 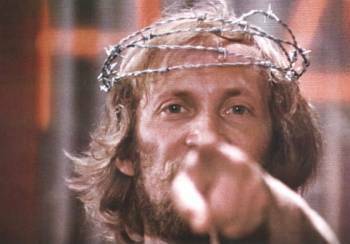 Do not allow the publication of any materials, reviews, comments or articles on A. Wajda's film Pilate and Others or all demands for its widespread distribution. The only information which can be published is the repertoire of a given studio theatre, including this film. This instruction doesn't apply to publications in the specialist film magazines, which require only the elimination of possible demands for widespread distribution. Even though Wajda refers to numerous models for his film, stressing the fact that he is quoting from them (there are also self quotations: the dump site and Judas' deadly run resemble the unforgettable Ashes and Diamonds), Pilate and Others does not thereby gain authenticity. It is insipid, artificial, boring Good Friday juggling. Since it does not go beyond surrealism to show any conflict or argument, the surprise is missing; the present confronted with the past (Judas in the funfair etc.) remains but an empty decoration. Apparently, the film caused such confusion within the management of German TV that for a few days before they agreed to show it without any cuts they were in a frenzy of indecision. This film leaves no one indifferent. You must see it. Wajda conveys his ideas in a light, imaginative way, and even though they might be disquieting, they are certainly unique. Yhis is also a film which must be discussed, since the deep meaning of the parable - the appearance of Christ and the living presence of his two thousand year old message in a consumer, technocratic contemporary society - gives rise to many questions and even more painful doubts. Man creates his own environment; he does not listen to the message of peace, he no longer understands the language of the Lamb, carrying his cross along an empty road, into a pale grey future. No one who was moved by this film, so actual in Lent, should be embarrassed by his tears.